It’s something I’m faced with all the time in Paris. I should go see this expo, I should go here, or there. Should I? An existential question! One that can also be reduced to platitudes: the fork in the road, the path not taken, one door closing to let another open, and so on. But letting go of the should means trusting that something else will be equally, maybe even more, worthwhile, memorable. The other day I planned to see a Caravaggio exhibit in a favorite out-of-the-way museum, well known among Parisians. I knew better than to arrive when I did: the wait was estimated at an hour and a half. I opted out. Instead, I headed north, meandering through one of my favorite parks toward another museum where I intended to stay for an evening concert. Though the day was chilly, the park was alive with other flâneurs, a few runners, and the loud chorus of children playing. 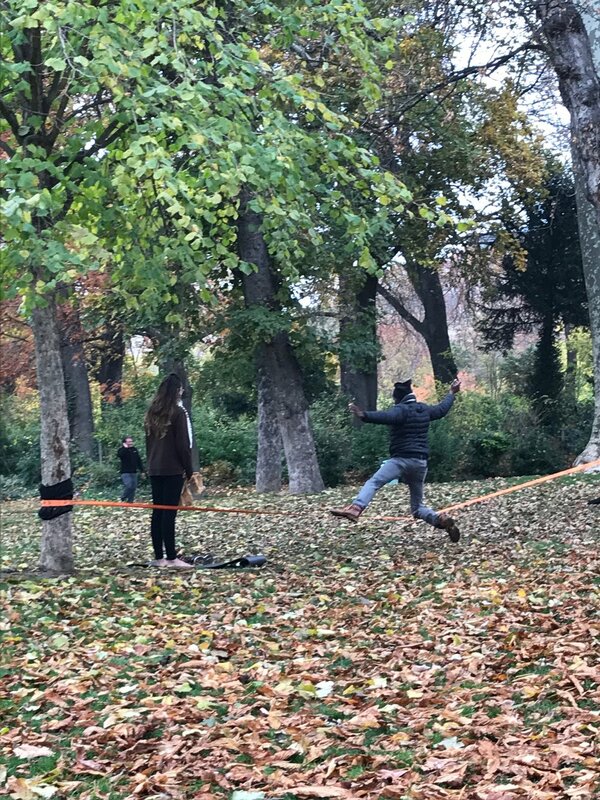 I stopped for several minutes to watch a lesson in what I can only describe as acrobatics on a narrow piece of tightrope fastened between two trees. Caravaggio could wait. What happens on the streets of Paris—ah, that’s as fleeting as the dust on butterfly wings. I had ample time before the concert to discover the arresting work of a 19th century artist I’d never heard of. And to learn that the entire neighborhood was once as active as Montmartre or Montparnasse, home to an extraordinary number of creative people from artists, actors, and musicians, to writers. An artist friend describes her work as the place where movement rather than thought directs her paintings. “Le corps, la main sait ce qui est juste.”* The body, the hand know what is right. And Van Gogh, whose words I find as compelling as his paintings, said, “It is better to be high-spirited even though one makes more mistakes, than to be narrow-minded and all too prudent.” It makes me wonder if we’ve grown afraid of making mistakes. I’ll probably go back to see the Caravaggio. But if I don’t make it, well, there’s magic in the miss.